From the cold of Minnesota to the heat of Brazil, classical guitar builders can be found all over the world. 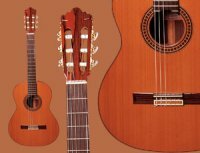 Yamaha, Gibson or Fender might come to mind when thinking about classical guitar manufacturers, but there are many others. Some of the very best classical guitars are built by luthiers in tiny workshops, creating only a handful of the world's best guitars in a year's time. Many of the most skilled craftsmen prefer working on a very small scale, contolling each step of the process personally, making instruments that are as near to perfection as possible. Shops building as few as one classical guitar per month are not unheard of. On the other end of the scale (of production), the huge manufacturer entities, like Yamaha, can produce thousands of guitars a day. The less expensive guitars are produced to a certain minimum level of quality, with there being some lack of consistency from guitar to guitar. When shopping for one of these, it pays to shop carefully and try many of them to find the one that sounds and plays the best. There are many excellent luthiers in Spain, where some of the best guitars in the world are produced. Jose Ramirez of Madrid, Antonio Sanchez of Valencia and Vicente Carrillo of Casasimorro are but a few of the better-known Spanish classical guitar makers. There are many other classical guitar manufacturers around the world. Luthier David Argent builds guitars in South Australia. In La Patrie, Quebec, Canada, Robert Godin's factory produces the excellent line of La Patrie guitars. The classical Giannini guitars have an interesting background. The company that builds these guitars is located in Brazil. It was founded by an Italian luthier named Tranquillo Giannini in 1900. In addition to standard 6- and 12-string guitars, the Giannini factory produces Brazilian instruments, including the 10-string viola and a 4-string steel Cavaquinho... both integral to the sound of traditional Brazilian music. The big boys, like Fender, Suzuki, Hohner, Guild and Yamaha, because of their size, are able to mass-produce good quality classical guitars at a reasonable price. They may not have the sweetest tone, or the most pronounced volume, but for the price they're not too shabby. These companies also make expensive high-end classical guitars that rival the quality of the small-shop built guitars. The bottom line of any guitar purchase is that the guitar must be played and listened to before plunking down the money, whether it's a mass produced student guitar or a famous classical guitar builder's work of art. Click one of the links below to find your next classical guitar!